Studying Acts may make readers feel as though they are stepping into a different world, a world of miracles, a world where God is alive and moving and doing remarkable things. How can that world intersect ours? How can the old story of people speaking in tongues and raising the dead come alive in a world where no one speaks in tongues and the dead stay dead? 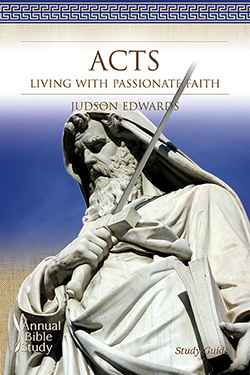 How can Acts be relevant to our lives and our church? In Acts, the people who believe in Jesus are filled with the Holy Spirit and set about the business of gathering a community. They have to decide how wide their tent is going to be and whom they’re going to embrace, so they give themselves to the task of breaking down walls. Jesus is not just for Jews, they decide. He’s for everyone. They launch out spreading the word. Paul becomes the focal point of the story, and he and his friends move about the ancient world telling all kinds of people the good news about Jesus and his resurrection. But there is opposition, and Paul is imprisoned. He is faithful even there, though, taking a stand before the government authorities. By the time the drama of Acts ends, Paul might be confined, but his message most assuredly is not. The gospel has been unleashed throughout that entire part of the world. Gathering a community. Breaking down walls. Spreading the word. Taking a stand. These four phrases organize this study of Acts and guide readers through a world alive with God and God’s mighty deeds. And all of us who have “drunk too deeply at the wells of reason and rationality” will once again pause to wonder and stand rapt in awe. The Acts Study Guide serves to educate the learner on major issues of appropriate interpretations, to offer an overview of theological themes, and to build the learner’s Bible study skills by considering several significant interpretations.